“28 Have you not known? Have you not heard? The everlasting God, the Lord, The Creator of the ends of the earth, Neither faints nor is weary. His understanding is unsearchable. 29 He gives power to the weak, And to those who have no might He increases strength. 30 Even the youths shall faint and be weary, And the young men shall utterly fall, 31 But those who wait on the Lord Shall renew their strength; They shall mount up with wings like eagles, They shall run and not be weary, They shall walk and not faint.” (biblegateway.com – NKJV). God looks pass your now and sees your future!! Greater is coming for YOU!! No matter what, don't give up or give in to the lies of the devil!! Your light afflictions are but for moment (2 Corinthians 4:17-18)!! The things you are seeing are ONLY temporary but the things you cannot see are eternal!! God got you and will NEVER let you go!! God is working ALL things out for your good because you love Him and are called according to His purpose (Romans 8:28)!! God sees you and He knows your pain right now and He is fixing it for you!! I repeat, don't give up!! Don't stop trusting in Him!! Rebuke doubt and unbelief and do not allow them to cause you not to believe the promises God has for you!! 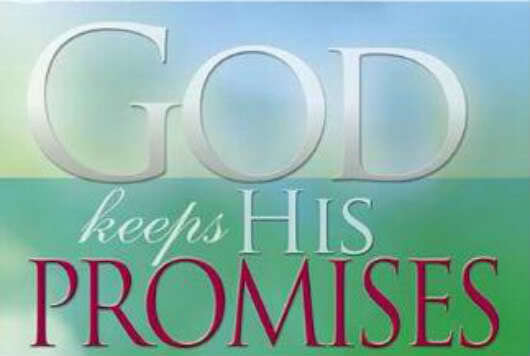 Wait on God to manifest EVERY promise that belongs to YOU (Isaiah 40:31)!! The devil comes to steal, kill, and destroy but Jesus has given you abundant life!! Walk in the power and authority Jesus has given you in Luke 10:19!! Jesus has given you the power to thread upon scorpions and serpents and ALL the power of the enemy and NOTHING shall by any means harm you!! Don't focus on what the devil is doing or trying to do but what God is doing and what HE IS going to do!! Faith without works is dead (James 2:14-26)!! Faith is not seeing before you believe but it is believing before you see!! Trust God even when you cannot see Him working; know that He is working on your behalf because He said He would – God have made you many promises and will bring ALL of them to past!! God has NOT forgotten about you; He knows YOUR name!! Believe God and expect a promise from Him each and every day!! Be encouraged; you are NOT alone – God is there with your!! May the peace of God guard your hearts and minds ALWAYS! !